With just one month left until Suicide Squad hits theaters nationwide, anticipation is growing at a fever pitch for this comic book adaptation. For those fans who want to emulate these colorful characters from the big screen, two companies have unveiled new Suicide Squad clothing apparel and footwear that will surely be big sellers amongst fans of Task Force X. While there will certainly be several more items debuting over the next month, you can check out Hot Topic and Converse's Suicide Squad gear right now. The Hot Topic collection will be available July 22 through the store's website HotTopic.com and in select stores across the country. 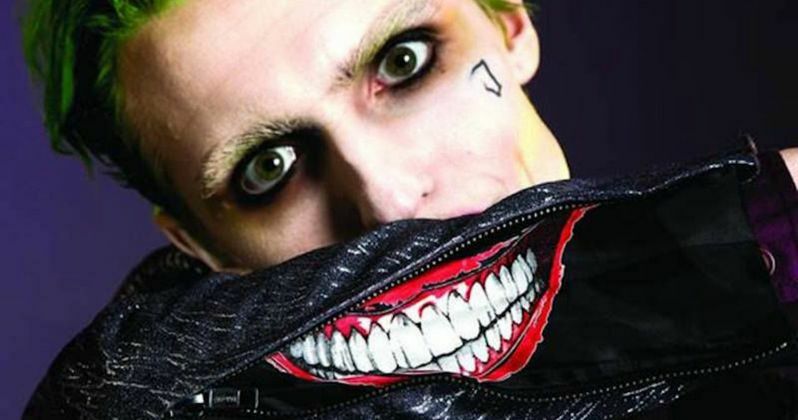 Almost the entire collection, which was revealed on Facebook last week, centers on iconic Suicide Squad characters The Joker (Jared Leto) and Harley Quinn (Margot Robbie), including Harley's now-iconic "Daddy's Little Monster" outfit. There is even a Joker outfit featuring a coat with a hidden sleeve pocket that features the Joker's smile, which you can use to create your own Joker smile. Unfortunately, the pre-order period for these items has already passed, but they'll still be available in stores and online starting July 22. For those heading to Comic-Con this month, you may see some of these items below in San Diego, since those who pre-ordered in time will have their items in time for the Con. It's certainly possible that fans could see a number of Joker's and Harley Quinn's later this month, along with Katana (Karen Fukuhara), who is also featured in this collection. For those who prefer to make a fashion statement with their feet, Nike is selling custom versions of the iconic Converse Chuck Taylor high-top shoes, featuring Suicide Squad characters. There will be three different versions of these shoes, featuring Deadshot (Will Smith), The Joker and Harley Quinn. The shoes will cost $80 and can be customized with the colors of your choosing along with a personalized message. Suicide Squad follows a team of the world's most dangerous villains, who are provided with a powerful arsenal and sent off on a mission to defeat an enigmatic, insuperable entity. U.S. intelligence officer Amanda Waller has determined only a secretly convened group of disparate, despicable individuals with next to nothing to lose will do. However, once they realize they weren't picked to succeed but chosen for their patent culpability when they inevitably fail, will the Suicide Squad resolve to die trying, or decide it's every man for himself? Take a look at this Suicide Squad apparel below, and stay tuned for more as we get closer to the August 5 release date.